The time is approaching for get-togethers with friends and family on the deck for barbecues, parties, and peaceful evening dinners. The deck is one of the spaces of the house where long-lasting memories are made. But the memories are always better when the location is well-maintained, and no one will enjoy remembering someone being injured from loose boards or a rotted wooden railing. 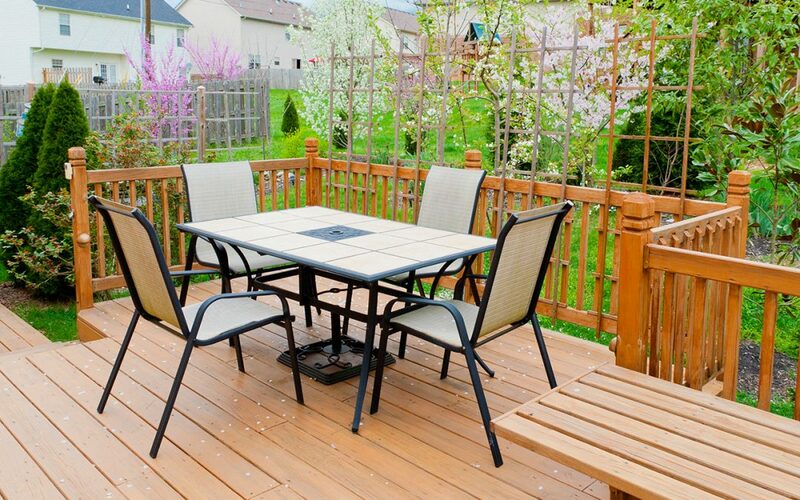 Here are five wood deck maintenance tasks that you should complete this spring so that you can enjoy your deck safely and comfortably this summer. Debris can accumulate over the colder months when you’re not using the deck, so you should wash it with a power washer to get rid of any leaves and dirt. When you are using the power washer, be sure to keep the sprayer moving evenly so that you don’t make any indentations or cuts into the wood. Once the wood is washed, you will be able to see any possible structural problems more easily. According to HouseLogic, 90% of collapsed decks are due to a broken ledger; this is a huge safety issue. It is advised during deck spring maintenance to make sure that the ledger is attached with lag screws and to make sure that the flashing does not have any rust. When you are inspecting the floorboards and railing, look for any rot or nails that are coming loose. Push against the railing without leaning to ensure that it doesn’t give way. Any rotten boards should be replaced, and if you notice any nails that have begun to push out of the wood, remove the nail with a hammer. You should then place a new screw where the nail was. If you do not feel comfortable taking on this project, hire a contractor. Decks usually need to be refinished every four to six years. One way to tell if it’s time to refinish the wood during this year’s deck spring maintenance is to see if the wood is turning gray. It the wood is gray and the water isn’t beading up anymore, it’s time to refinish. First, you will need to sand the wood using a power sander. Smooth out any rough spots, and make sure that you have a clean surface before staining. Next, thoroughly clean off any dust before applying an exterior stain to protect and seal your deck. When you are finished with these five wood deck maintenance tasks, you will know that your deck is safe for you, your friends, and your family to enjoy. You will also see a new beauty in your deck that everyone at your next barbecue will enjoy. For best results, and especially if you are unsure of the condition of your deck, hire a professional home inspector to inspect your deck and provide recommendations. If you need a property inspected in Southwest Virginia, contact Master Home Inspections.